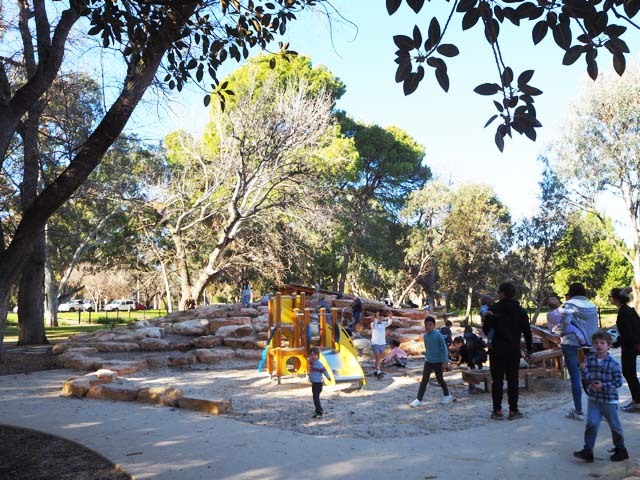 The Marshmallow Park located on Glen Osmond Road near Adelaide CBD was recently renovated and reopened in April this year. The existing climbing structure remains however this playground has now been transformed into a nature playground with additional wooden climbing structures outside of the playground for even more fun. This fully fenced playground offers some jellyfish-like climbing pods for kids to climb on, a climbing structure and a small three person swing (more swings would be great) on one side. Close to that, there is a large slide which is quite steep I must say (even for us!) but some kids seem to enjoy it. A very popular space is the rock mound with a small structure with slide for little ones and water play activities. There is also a climbing structure with large wooden beams. This playground will be a cracker in spring/summer with the water play area, lots to do in this beautiful nature playground. Little Miss wished there were more swings though. A fully fenced playground great for kids of all ages. Kids love the water play area even in winter! This playground is located off Glen Osmond Road in Adelaide near the CBD close to South Terrace. There is free parking along Glen Osmond Road.